2-CD with 36-page booklet, 48 tracks. Playing time approx. 136 mns. 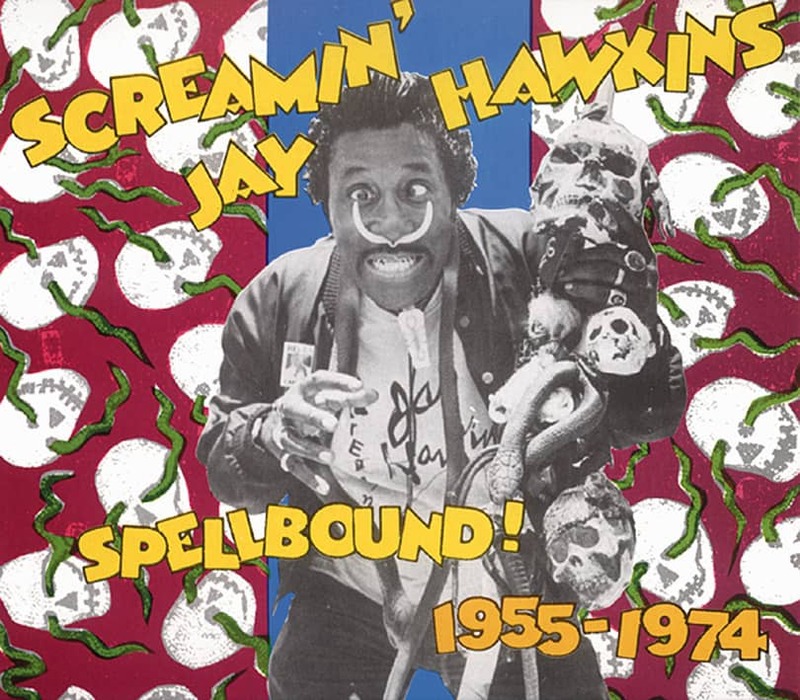 Esquerita may have been one of rockin'est cats ever, but Screamin' Jay' Hawkins was certainly the weirdest. 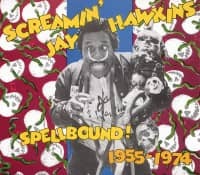 A true original who has been steadily recording for more than 40 years, Hawkins conjures up images of voodoo evil and satanic rites, all presented in an often looped manner that defies all norms. The man who opened his live shows by rising from a coffin was not the easiest performer to market, and as a result the hit total is scanty. His recording career is scattered amongst some two dozen labels, and while his most sustained stretch, with Columbia's Okeh subsidiary label, has been digitally documented elsewhere, this fine collection gathers together the important missing pieces: two sessions for Mercury and Wing in 1955, two sessions for Decca in 1966, four sessions for Philips in 1969 and a one-off single session for RCA from 1974. Among the many goodies are two remakes of I Put A Spell On You plus such wonders as Voodoo, She Put The Whamee On Me, Feast Of The Mau Mau, Constipation Blues, Bite It, and, just to complete the cycle, You Put A Spell On Me. Add to this an amazing, photo-filled 36-page booklet and you've got a pretty strong picture of an amazing, if unorthodox, performer. 02 Do You Really Love Me? Jalacy J. 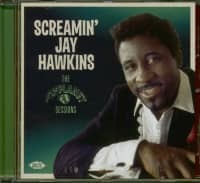 'Screamin' Jay' Hawkins was born in Cleveland, Ohio, on July, 18, 1929. "I came in this world black, naked and ugly. I will go out of this world black, naked and ugly. So I enjoy life. And I like to see when people are happy... And if I can, since I am in this business, I like to make people forget some of their problems. I like to make 'em laugh." Nice introduction. But life wasn't so fair to little Jay. When he was still a baby his mother dropped him off at an orphanage. He was raised by a tribe of Blackfoot indians who took him out of the orphanage when he was 18 months old. At the incredible age of three, Jay was already playing the piano by ear. It was now 1952: Jay left the Army and was out looking for a way to turn his talents into money. He obtained his first professional job as vocalist, pianist, chauffeur, valet and gofer with the late Tiny Grimes, a jazz and R&B guitarist who played a four-stringed instrument and led a band called the Rockin' Highlanders, whose stage attire included kilts and tam o'shanters. Jay cut his first vocal sides with Tiny's band in 1952, a record entitled: Why Do You Waste My Time / Canadian Boogie. Then, on September 12, 1956, Jay recorded for the second time a straight ballad entitled I Put A Spell On You. Jay recalls, "Columbia A&R man, Arnold Maxin, said to me: 'Do this song a little different... Do not regard this as a recording session. This is a picnic!' People came in with pork shops, greens, hamhocks, ribs, chicken, chitlins. I mean he had downhome soul food. And all kinds of booze: wine, scotch, bourbon, vodka, gin and rum. We were DRUNK! We laughed, told jokes, and we partied. Some where, I think about 45 minutes later, I heard a voice say: 'Let's make a record.'" Ten days after the session, Jay dropped the needle on a test pressing and shuddered to hear himself wail. "I listened," he says, "and I did not believe that I had made that record. I had no idea that I could scream like that." The record was released and a lot of dee-jays lost their jobs playing it. It was an underground sensation and, according to Jay, sold over a million copies. After its success, Jay took to wearing horrific costumes and props...zebra skin capes, rubber snakes, the cigarette smoking skull that he called Henry. "The name had been made,“ Jay recalls with dramatic flair. "Now the act was born. I created a mystery." He suddenly looked evil, hip and ready to inflict fresh psychic damage. On the cover of the Philips album 'What That Is', he is laying in a coffin, one eye open, raising the lid. The coffin was Alan Freed's idea, Jay says of the most notorious part of his act. He recorded gems such as Constipation Blues (written he says on toilet paper in hospital after an ex girlfriend cozied up to him with a butcher knife), Alligator Wine, Frenzy, and The Feast Of The Mau Mau. I Put A Spell On You became his ultimate trademark and has been covered by Nina Simone, Arthur Brown, The Animals, Creedence Clearwater Revival, Manfred Mann, The Who, Alan Price...and more recently by the modern shock rock idol Marilyn Manson. The movie screen loved Jay too (we all remember his legendary appearances in 'Dark Decision', 'American Hot Wax' and Jim Jarmusch's 'Mystery Train'). ...And lately (in July 1997), Jay spent some weeks in Memphis cutting a brand new album at Sam Phillips Recording Service. Produced by Jim Dickinson, the result was far beyond expectation. He led a restless life (he has lived at various times in Europe, Alaska and the Philippines, to name a few), and spent his last years in France. His last major show was at the Olympia in Paris, in May 1998. This show was recorded and released end of November 1999. It was his farewell album. This much is sure, there never will be another Screamin' Jay Hawkins. He was larger and louder than life itself. After high school, Hawkins joined the Army on 26 December 1945. He was 16 years old and not 14 as previously reported. He helped to clean up Okinawa where the Japanese were still fighting even when the war was over. After two two-year stints in the Army, he switched to the Air Force in September 1950. During military service he pursued an earlier interest in boxing allegedly beating Billy McCan for the professional middle-weight championship of Alaska. He also saw duty in Germany and Korea. Military records show that he was honourably discharged in June 1952 but he sometimes claimed to have been invalided out of the Armed Forces earlier having sustained an injury from a hand grenade in a Korean foxhole. Either way, he settled in Philadelphia where jump blues was casting a tall shadow over other forms of black music. Hawkins secured a steady $30 a week position as singer, pianist, chauffeur and valet to Tiny Grimes, the four-string guitarist already renowned for his contribution to the enduring brilliance of the Art Tatum Trio. By 1952 Grimes was fronting the Rocking Highlanders, whose Gaelic attire readily demonstrated the advantages of drawing attention to oneself. Grimes was quick to admit that donning tammies and tartan was a good career move ("the kilts really did it for us, they were the best threads on the scene") but he was soon upstaged by his young vocalist whose stage apparel often resembled something out of an ecclesiastical shop window. 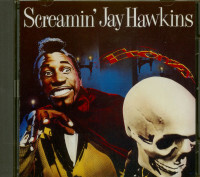 Jay Hawkins's formidable discography began in Philadelphia over 55 years ago. As vocalist with Tiny Grimes' Rocking Highlanders he cut Why Do You Waste My Time (Gotham) and No Hug, No Kiss (unissued until its appearance on a Tiny Grimes compilation in 1986). 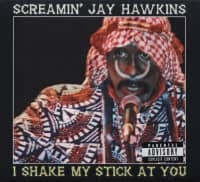 This, as far as can be determined, was Hawkins's first excursion into a recording studio and, like many a later rock 'n' roll auteur, his style sprang forth fully fledged. Right away, he asked serious questions of the listener's commitment with performances which started way over the top and worked upwards. Atlantic Records came next. The venerable label grew into an institution noted for its taste and prescience, but it couldn't handle Screamin' Blues by Jay Hawkins with Tiny Grimes on 12 January 1953. Our unrepentant boxing champ is said to have punched out Ahmet Ertegun when the company boss asked him to sing like Fats Domino. Atlantic have yet to liberate this mildewed tape from their vaults and R&B connoisseurs may never get to hear this mysterious example of the blues screamer's art. On leaving Tiny Grimes, Hawkins played or sang with a host of notable jazzers and pre-rock rockers including the Fat Man himself: He was sacked for continually upstaging the comfy New Orleans megastar. There were equally short engagements with Johnny Sparrow (at Philly's Powelton Café in May 1953), James Moody, Arnett Cobb, Bill Doggett and Lynn Hope, the tenor saxman who conjoined bar-walking hysterics with a graceful, sweet-toned musicianship. Hawkins acquired an interest in the Moslem faith from Hope, as well as his preference for Islamic head-dress. He was eventually encouraged to turn solo by Wynonie Harris whose gruff baritone voice remains one of Hawkins's more probable antecedents: others would surely include Slim Gaillard, Cab Calloway, King Pleasure and Billy Eckstine. One of Hawkins's records for Timely, Baptize Me In Wine, echoed the rumbustious drinking blues which Harris had already popularised. The other side, Not Anymore, with slide guitar wizardry from Mickey Baker, was perfectly illustrative of blues at its most exquisite. Both are included here. Customer evaluation for "Spellbound 1955-74 (2-CD)"